I've been reading a lot of info on here trying to get prepared for my solid axle swap on my pickup. Finally i scored a nice 85 axle for a few hundred off craigslist. These things are getting hard to find! I ended up piecing my own kit together over the last few months as paychecks come in. Marlin Springs 4", Allpro high steer, ubolt flip kit, shock hoops, shocks. I fabricated my own front spring hanger, cut some DOM tubing for the holes that need to be cut through the frame. I templated the length from a kit my buddy had purchased. Ended up being cheap since i had the right size tube for a project we have going at work. Got the front wheel spacers from a friend who bought them and didnt need them, so i paid $20 for those. All the grease able 18M bolts I purchased from a surplus store, for half the cost online. I rebuilt the axle all new seals, bearings, gaskets, studs, etc. This took me a while to do as I had never built one before. However, youtube provided some answers and this forum gave me the rest! I'm at the point now where I have the axle mounted and everything hooked up. The issue I am having now is when I have the truck on the ground it has issues turning all the way to the drivers side. Its a good half an inch away from the bumpstop.... When i lift it off the ground Im able to turn it all the way. Do you guys thinks this has something to do with my alignment? Or something else? I can't see it binding on anything or hitting bumpstops on the other side. Also I added plating to my steering box and now it seem to be binding a hair when in the middle. I can still turn lock to lock when its off the ground but it feels tight when its around center... Any ideas on that? Any advice on this would be appreciated. Thanks guys! Rear suspension - I have the spring(Got from marlin) and an E locker i found at a junkyard. Need to piece together the rest. Likely will fabricate the hangers. Because we all like pictures, here you go! Welded on a clone of the Ruffstuff IFS frame stiffner. My buddy never installed his and so I copied it and got a sheet of 3/8" steel and cut it using a plasma torch. Cut through the frame and welded in the tubes for the shackles. Air compressor wasn't good enough for my buddys plasma cutter, so we made this and connected two to it. Shackle Angle its about 90. It should settle a bit with these new springs. I'd say your drag link is a bit long and the steering box is maxing out. Try shortening it to equalize travel and pulling steering wheel and put it on straight. So I just need to pull off the drag link and screw the ends in further? I didn't seem like the box was maxing out, when I had the weight off​ the wheel it was able to travel further. I'll try it out and get back and update my results. Need some help. Ive been messing with the steering for a few days now. I double checked my alignment seems perfect. Exactly 1/8" toe in. Try turning the truck on, slowly drive and turn. Maybe the knuckle shims are off. Any up and down play in the knuckles. Just checked the knuckles are nice and tight no up and down play at all. The entire axle has been rebuilt before it was installed. Bump. Still looking for help anyone had this issue? Have you checked the steering stop on the front of the axle, on the other end of the axle? Yes i checked both sides front and back. It doesn't hit any bumpstops when on the ground and has about the same gap on both sides when turned to the drivers side, roughly 3/4". It is very close to the bumpstop when turning to the passenger side maybe 1/4". See pictures above. When its in the air and no weight is on the tires, it can turn all the way and hits both bumpstop in each direction. No gap on front or back. Thats why I am so stumped, and so i assumed it was the drag link that needed adjusting. 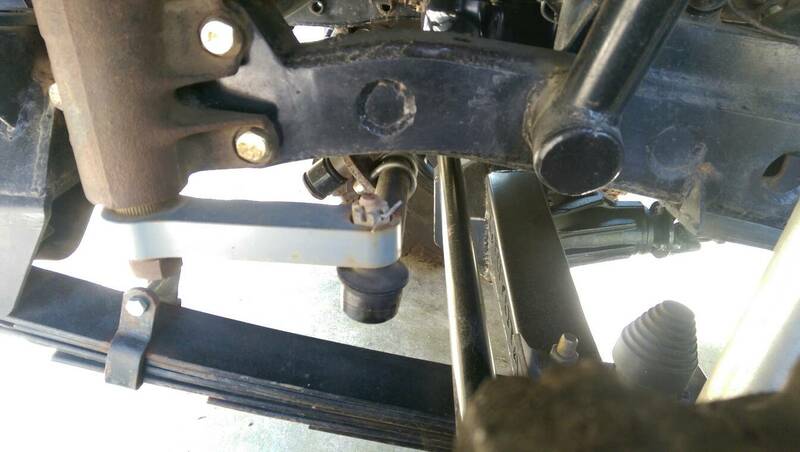 Can you post some pictures of the steering box bolted on the frame, pitman arm, drag link and tie rod? I'm 99% sure it is not rubbing, i double checked it and no paint is missing and had a friend watch it while it turned. Daniresch here are the pictures. Let me know if you need more pics. Thanks for the help guys. Disconnect the driver side tie rod end from the high steer arms and feel how the wheels turns back and fourth. I want to eliminate birfield binding and trunnion bearing preload installation mistakes. I mainly want to focus on the fact it steers fine when there is no weight on the wheels. Other things to consider: As Ovrarok mentioned, it looks like your pitman arm is going to smack into your tierod when the driver side wheel travels up. We need a better picture of how parallel the tierod and draglink are. Two ways to fix this, shorter pitman arm (skys-offroad has a good option) or move your steering box further forward. Also, you need to swap your u-bolts out on the driver side axle for square ones made for the 1985 axle. Okay, so i haven't pulled the tie rod end off just yet, But when i lift the front end it turns easily and smoothly and all the way to each bumpstop. Ill pull it off this weekend and check it again. How would i know if it was binding on the birf or if the bearing preload was done incorrectly? And yes you guys are definitely right my pitman arm is to long it and it will hit. Thanks for the catch. It came with the high steer kit i got, so i assumed it was okay. So ill have to order the one from sky. For the Ubolts, i've called around to a few places and cant seem to source the square ones. Any ideas where i would be able to get those? If I got with the shorter pitman arm does it effect my turning in any way? wish I could answer, but when I did my sas. I went with flat pitman arm. my steering box is in a little different location as well. Yeah I think if I use a flat one it would hit my frame. But a short 3/4" drop pitman should hopefully be the solution for that issue. What year is your frame? And did you relocate the box forward a good bit? Mine is an 87 too. Maybe it would be better to just relocate it further forward. Did you get sleeves to weld through the frame when you did that? Also how did you extend the shaft from the steering wheel? Here's a bit of a random observation: Are you front shocks too long? It looks to me like they might bottom out long before your front suspension does. Are those 14" shocks? I'm pretty sure I'm only running 12". When I was still running Bilstein shocks they became bump stops as I was able to bottom them out often. I did care for the abrupt end to my suspension, it was not much different than coming down on the rear bumper.